Just 20 minutes before re-entering Earth's atmosphere, these amazing images show the Atlantis space shuttle as it hurtles across the face of the sun. But they weren't taken by Nasa, nor by a professional astronomer using multi-million pound equipment. 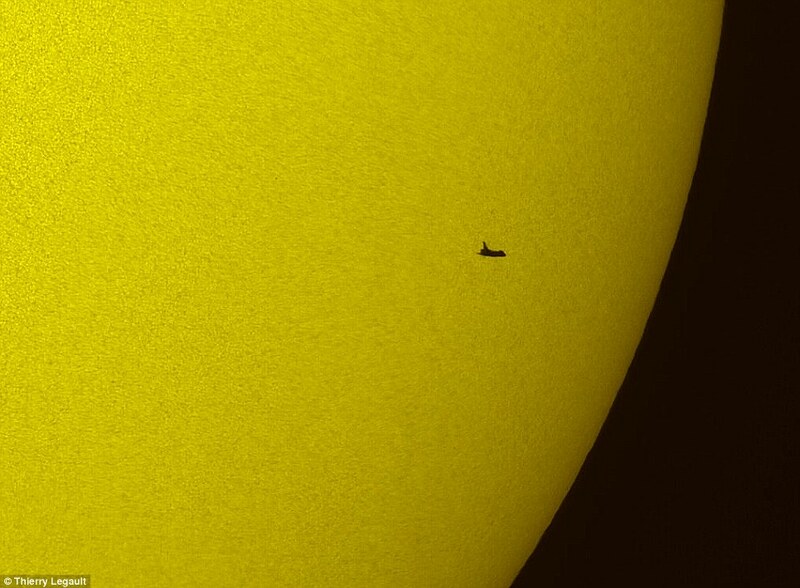 Instead, the photos, clearly showing the tiny silhouetted outline of the shuttle in front of the sun, were captured by an amateur photographer standing in his back garden. Even more incredibly, French photographer Thierry Legault had only 0.9 seconds to get his shot - but still managed to capture the spacecraft four times as it travelled at 7.8km per second. 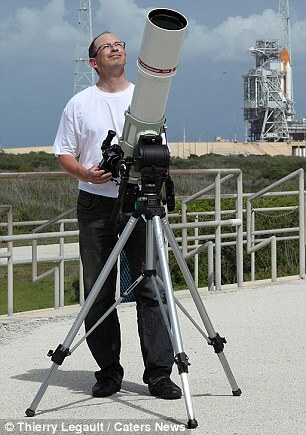 He attached a camera to a telescope trained on the sun - with a solar filter to help prevent its powerful rays destroying the equipment. Mr Legault sat patiently waiting for over an hour, readying himself to capture the image in the Emden area of Germany on July 21. 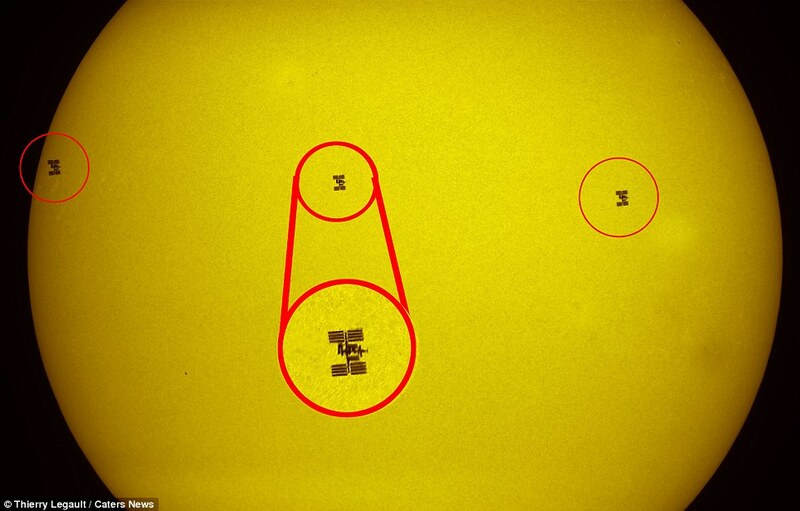 The 49-year-old engineer said: 'What you see in the photos is the Atlantis space ship passing in front of the sun, therefore you see just a silhouette. 'Good transits last less than one second, and the best ones maybe less than half a second. 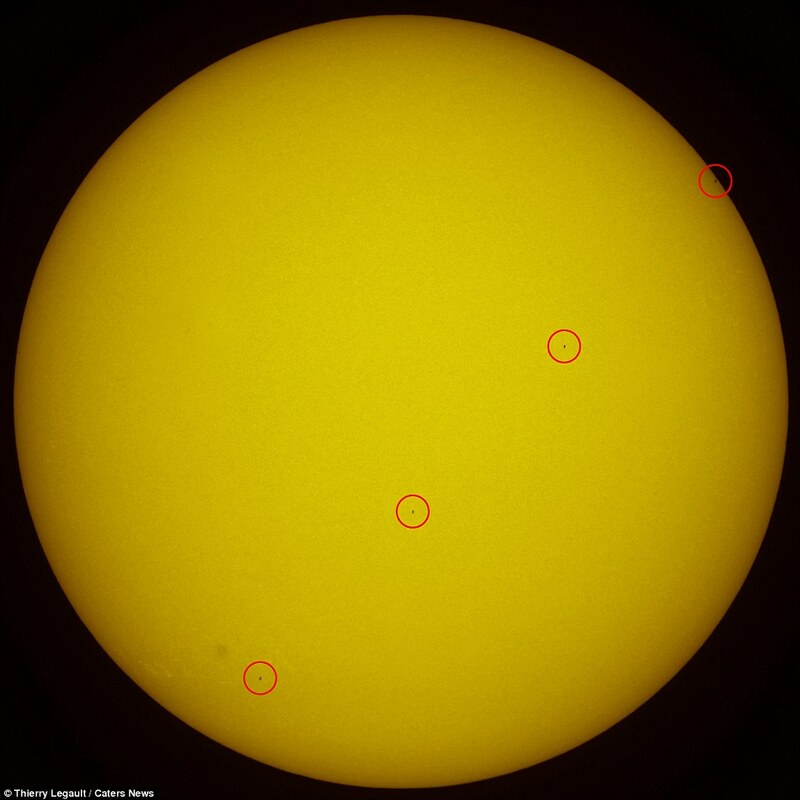 The amateur astronomer - originally from Paris - began taking solar transit pictures in 2006, and has gone on to capture over a dozen since. He followed Atlantis' mission closely, also snapping pictures of it as it docked at the International Space Station on July 15 - and then again as it departed on July 19. Mr Legault added: 'The main difficulty is finding a good location to photograph the transit. You need a quiet, accessible place in the countryside, without trees, big roads and private properties. 'But the most difficult part is the weather. In western Europe, especially northern countries, it changes often and is not reliable, even in summer. The Frenchman uses a radio-synchronised watch to make sure he knows exactly what time - down to the second - the shuttle will pass across the sun. But despite his precision planning, he admitted he never knows if he has captured it until afterwards. He said: 'I never know in real time if the shooting has been successful, because during shooting I look at my watch, not through the camera.